Whether they’re business travellers or holidaymakers, adults on a day out or children on a school trip; getting people comfortably and safely from A to B is a big responsibility. 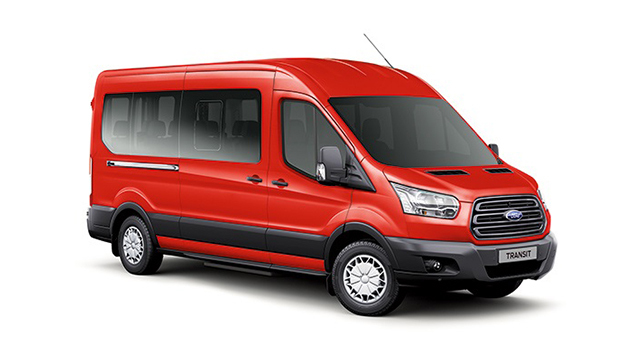 So make sure you choose a vehicle that’s purpose-built for the role and is designed to make everyone feel they’re travelling in style: the Transit Minibus. Laid out with offset double seats on one side of the aisle and single seats on the other, the factory-built Transit Minibus M2 offers unrestricted access to the passenger compartment. An extra-wide sliding side door provides two regulation-size exits for easier entry and exit. All models feature a power-operated side step, and passenger assist handles conveniently located on both sides of the side door. With its light and spacious fully-trimmed interior, Transit Minibus has been designed to make even the longest journey a pleasure. New overhead storage shelves (standard on L4 H3 models, optional on L3 H3) offer convenient stowage. Additional comfort is provided by optional rear air conditioning with aircraft-style vents and individual LED reading lights for each rear seat. Model shown is a Ford Transit Minibus L4 H3 Trend. Note Transit Minibus H3 (high roof) cannot be tted with a roof rack. Safety is important to us, so the new Transit Minibus does all that it can to help protect you, your passengers and those around you.